Extract, Extract… Read all about it! ‘Tis the season for baking, or if you prefer, eating those delicious baked goods! Many recipes call for deliciously flavored extracts or baking powder to make cookies and cakes amazing! Have you ever thought about where people during the turn of the century got their baking supplies from? Probably not…A better question is- What does baking extracts have to do with the history of Ashland? Well, my gentile reader, grab yourself a slice of cake and I will tell you about an old Ashland factory called Moshier Brothers. 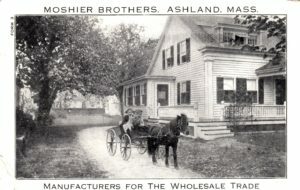 The Moshier Brothers, William and Charles, started their own business in 1877 in Salisbury Center, New York. With a horse and carriage they hit the streets of upstate New York selling tea, coffee, and other related items. (I hope they sold some cookies to go along with the tea and coffee!) In 1882, the brothers expanded their business to include quality spices, baking powder and flavored extracts- Lemon, Orange and Vanilla. Guaranteed to be free of artificial flavoring or artificial Vanillin – artificial Vanillin is just as it says artificial vanilla, it is cheaper than organic vanilla. (You could say that the Brothers were organic before organic was cool!) The Vanilla beans came from Mexico, since they were considered to be the best in the world and were aged properly to give a more pungent flavor. Likewise, only pure fruit juice was used in the lemon and orange extract. The Brothers had a good product which quickly became a staple around New England homes and later the country! Kay Powers wrote that “many of the names of those first customers were still on the books thirty-five years later” – a fact that the company took pride in. In 1903, the company needed more space for production and moved from New York to Hopkinton, MA. Sadly, Charles Moshier had died suddenly in 1899 leaving the business to William. The next tragedy struck in 1910 when the Hopkinton location burned down. Thankfully, they did not have to look far, the old Balcom Shoe Factory at 29 Alden Street, Ashland, was available (Today it is Ashland Auto Service). The Moshier Brother Company turned the dirty shoe factory into the cleanest and most sanitary building around! The factory was clean, well lit, and well ventilated- a big deal considering the conditions of other factories at that time. I can only imagine how it must have smelt from the outside… I’m thinking sugar cookies.. And now I want one, yumm! The factory remained in Ashland until it closed in the late 1950s. The reason that it closed is uncertain. One possibility is that there was no one to pass the business on to. William stayed with the company until the 1920’s when his son Phipps took over the business. William died in 1944 at the age of 88. Phipps died in 1968 at 67 years old. I will leave you with a final story that you can share while you are having desert this holiday season, your friends and family will be impressed with your Ashland History! It is the story of William Moshier and the vanilla bean cases. While renovations were being conducted to his 2nd floor Ashland office, William noticed that the vanilla beans were shipped in mahogany containers! So he did what any creative and thrifty person would do- he had his office paneled with the wood from the crates! That must have been a magnificent sight and smell! Sources: The Factory Smelled Delicious!, Kay Powers, Ashland Directions, April 1988. Inlet History: The Contributions of William D. Moshier by Charles Herr, May 2014. Photo: Moshier Brother’s advertisement card.